Through regional cooperatives, ASDB provides services to students who are deaf/hard of hearing, blind/visually impaired, multiply sensory disabled, or deaf-blind at their local schools. The regional cooperatives were created to help support students who are deaf/hard of hearing or blind/visually impaired in the general education classroom within their public school setting. If a student requires full-time intensive services from a teacher of the visually impaired or a teacher of the deaf/hard of hearing, the Individualized Education Program (IEP) team will look at all the options available to best meet those needs. When it is determined that a student’s level of hearing or visual impairment has an impact on his/her education, the Individualized Education Program (IEP) team determines which services and service times will best meet the student’s needs. ASDB can provide the following depending upon what the IEP team decides: specialized staff, district staff training, equipment, audiological or vision-related services, assessments and other training or support needed. A regional cooperative is an agreement between school districts/charters and Arizona State Schools for the Deaf and the Blind (ASDB) intended to increase the ability of districts/charters to identify and serve children who are deaf/hard of hearing, blind/visually impaired, multiply sensory disabled, or deaf-blind. A pilot project of three regional cooperatives was authorized in 1987. The North Central Region started operating in 1988. The Southeast and Southwest Regions started operating in 1993. The last two regions, Eastern Highlands and Desert Valleys, became operational in the 1998-99 school year. 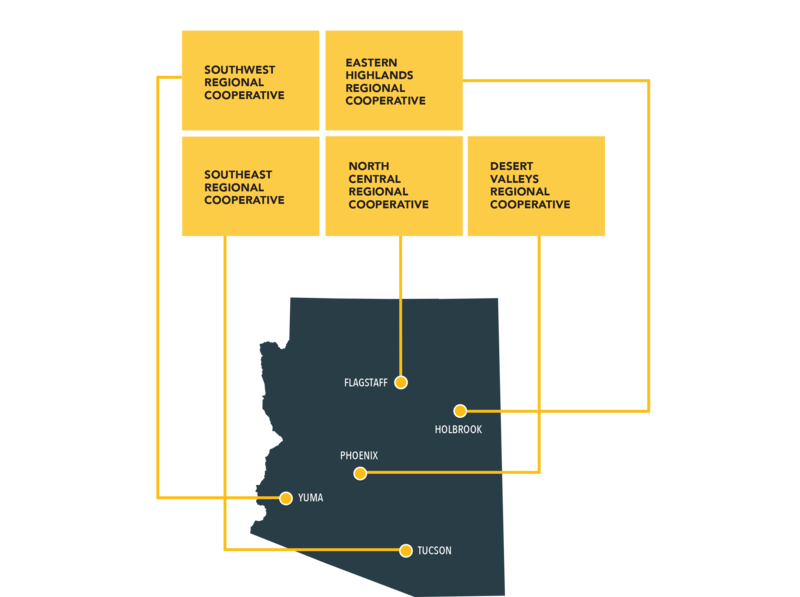 The ASDB cooperatives serve member school districts/charters throughout Arizona. Districts/charters become members by signing an agreement with ASDB. The number of students with sensory-based special education needs is low. Education services for students who are deaf/hard of hearing, blind/visually impaired, multiply sensory disabled, or deaf-blind require specialized staff, training and equipment. Most school districts/charters do not possess sufficient numbers of children nor the expertise to provide services on their own. The typical school district/charter would require part-time personnel to meet the needs of its small population of sensory based education needs. It is extremely difficult to recruit and retain these type of specialized staff on a part-time basis, particularly in rural areas of the state. *Please note: regional cooperatives provide services only when it has been determined that the student’s level of hearing or visual impairment impedes their access to a free appropriate public education in a general classroom setting. This program is designed to provide for the special education and related service needs for students who are classified as deaf/hard of hearing. Special education and related services are provided by the cooperative to a student who is enrolled in a regular education setting at their local school. Since the student’s Individualized Education Program (IEP) is based on the student’s level of hearing, this student is counted by the cooperative for voucher funding. In turn, the cooperative pays a reimbursement for regular education programs and services to a host district, which frequently is the district of residence. The local school is responsible for daily transportation. All funds generated through voucher funding, or any other source, shall remain within the region and used for the benefit of students served. All administrative costs shall continue to be the responsibility of ASDB. This program is designed to provide for the special education and related service needs for students who are classified as blind/visually impaired. Special education and related services are provided by the cooperative to a student who is enrolled in a regular education setting at their local school. Since the student’s Individualized Education Program (IEP) is based on the student’s classification of blind/visually impaired, this student is counted by the cooperative for voucher funding. In turn, the cooperative pays a reimbursement for regular education programs and services to a host district, which frequently is the district of residence. Students counted for voucher funding who are legally blind will also be counted for American Printing House for the Blind (APH) program benefits. All funds generated through voucher funding, or any other source, shall remain within the region and used for the benefit of students served. All administrative costs shall continue to be the responsibility of ASDB. This program is designed to provide for the special education and related service needs for students with a documented sensory impairment who are classified as multiply disabled (MD), multiply disabled severely sensory impaired (MDSSI), or in any other special education category. Special education and related services to address the student’s sensory impairment are provided by the cooperative to the student who is enrolled in a regular or special education setting in the student’s district of residence or in a host district. Since the student’s special education and related service needs are complex and derived from multiple impairments, these children are counted by the district of residence receiving categorical state aid for special education. In turn, the district of residence pays a fee for service to the cooperative for special education programs and services related to the student’s sensory impairment and, possibly, to a host district for services rendered by the host district. When the MD or MDSSI student’s special education and related services needs are derived primarily from the student’s sensory impairment, that student may be counted by the cooperative for voucher funding. In these cases, both the district and the cooperative staff must agree that the student’s special needs will be most effectively met by cooperative services. The district of residence is responsible for daily transportation. Children counted on the district of residence census may also be counted for federal flow-through funds used to supplement the student’s education program as well as American Printing House for the Blind program benefits. All administrative costs shall continue to be the responsibility of ASDB. The cooperative shall not consider administrative costs in determining annual fee for service rates that are charged for programs and services students receive. Initiation of the referral must start at the public school. The student must fail two school hearing screening or have a documented hearing loss by an audiologist. The public school district/charter contacts their ASDB cooperative. The team will hold a Multidisciplinary Evaluation Team (MET) meeting. At this meeting, parents will sign a permission form for staff to do an evaluation. The referral form or documentation will be given to the audiologist who will test the student’s hearing/review the information. Once the audiologist has determined that the hearing loss/level of hearing is non-correctable or that the loss will most likely affect their educational access, the audiologist will pass on the referral to cooperative staff who will conduct an evaluation and gather information to see if the impairment/level of hearing impedes the student’s access to the educational environment/information. If it is determined that access to the educational environment/information is being impeded, then the team meets to develop an Individualized Education Program (IEP) to determine what types of services and service levels are needed. The student must have a documented visual impairment by a licensed eye care doctor (opthalmologist/optometrist). Cooperative staff will conduct an evaluation and gather information to see if the impairment impedes the student’s access to the educational environment/information.